The Moulin, with its twin aspect over the courtyard and waterfall, has been tastefully renovated with exposed beams and original stonework giving you a real sense of history whilst feeling comfortable and modern. 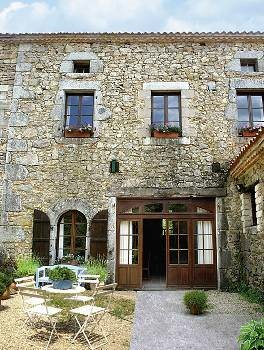 The gite boasts a generous, open-plan living area with evidence of the original wood works of the mill. The open kitchen, lounge and dining area creates a great space for socialising together and relaxing. The fully equipped kitchen has a microwave, oven, dishwasher, fridge and all the utensils/crockery you need to prepare fabulous home-cooked meals around the large dining table. There is a furnished private sun terrace with BBQ for dining al fresco with views over the waterfall and woods beyond. On the ground floor there is a bathroom and separate toilet. On the first floor there is one double bedroom and two twin bedrooms with a further bathroom and separate toilet. Le Moulin Living / Dining area. Dining area with view thru the arch.